Jasper | A Blog appART. 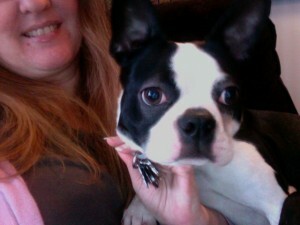 I was just thinking about Jasper (my Boston) and when it was that he got neutered about a year ago. I looked it up by searching this site on the word “neutered” and found this. Jasper was neutered on your 50th birthday! That’s gotta mean something, but I don’t know what. Yesterday we went to the pet store and got the dogs a toy that was an apple and a worm attached together with a string, except the apple looks more like a bagel/donut, and the worm looks like a fat green sausage that sticks through the hole. Yeah, I know, very sexual, but that’s beside the point. Coming up, April 23 is the anniversary of when Plato decided to get old. I haven’t written about Jasper much lately, so I think it’s about time for a Pupdate. So not as high quality as an actual CAMERA photo, but it will do. He was moving a lot too…trying to steady a laptop while holding a wiggly Boston is not easy. Notice how his tearstains have diminished? I don’t know why they were more noticeable as a puppy. He had his nine month birthday the other day. We took him to a pet store and let him pick out a toy…a stuffed jack-type shape. Jasper is a nut. He LOVES my perfume. It doesn’t matter what kind…my own creations or commercial…he likes to sniff and lick my wrists. I try not to let him lick so he won’t lick it off me, as it wouldn’t be good for him and defeats the purpose of perfume, which is necessary with a Boston as I’ll get to in a minute. No other pet we’ve had, except for long-departed Natasha the Cat, has liked perfume. Most dogs and cats I’ve had really don’t like human perfume at all. Dogs especially prefer natural animal odors, and the stinkier the better. I don’t know what it is about Jasper, or Natasha for that matter, that makes them like the sweet smells. Stan and I always kid around about what the animals would do or be if they were human. This will vary greatly from puppy/kittenhood to the time they are an adult. As a puppy, I always said Plato would be either a musician or a demolition expert. By the time he died, I realized Plato would’ve been the next Stephen Hawking. When he was younger, he would stare at my art, which would cause him to spin around, stare more at the art, and spin more. We said he was contemplating stars going around in his head. We were watching a Discovery show with Stephen Hawking at the time Plato was dying. They reminded me of eachother in a strange way. Jasper has the makings of a musician and demolition expert as well (especially demolition of office supplies and personal care products such as emory boards, carmex tubes and unused feminine hygiene products). Jasper is a very musical dog, but his musicality is more in terms of what he does with squeak toys. He LOVES squeak toys, and makes great rhytyhmic sounds with them. Plato actually HATED the squeaker and would try very hard to remove the device from all toys that contained it. Plato’s musicality came more from his own voice…he used to sing as he whined. He sang so well until we boarded him for a few weeks one year (while taking Hieronymus with us…bad mistake–never, ever ever separate the pack…either board both or take both with). He was so lonely without Hieronymus, when we came to pick him up, he was practically hoarse from barking so much. He never sang right again. If Jasper and Plato could’ve known eachother when they were both young, Plato would be the singer and Jasper would be the musician. Jasper also clucks like a chicken. Sometimes we call him Chicken Dog. Jasper is also an artist. We gave him some toys that were made of colorful synthetic rope. He shreded the rope, which created such beautiful fiber art. Hieronymus, named after Bosch, was supposed to be the Art Dog, but his vision was way too bad. 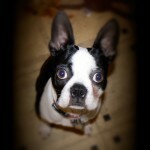 Jasper is a very social dog, loves to meet new people, very submissive with new dogs…very unlike Plato in that way. In other ways he reminds me so much of him….the way he “moops”, the way he “oofs” (must be universal Boston Terrier noises)…and the bad gas. 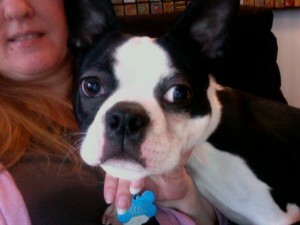 Actually, as far as external body odor, I think Boston Terriers are the absolute best smelling dogs there are. You can put your nose right up against their body and they will smell so good…no doggy odor. 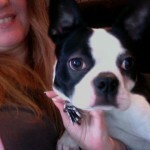 Even Pugs, which are also very clean smelling dogs, do have a certain “Pug odor.” But not Bostons. Their short coat and lack of wrinkles probably help in that regard. However, do a search on “Boston Terrier Gas” and you will find that they are probably one of the smelliest dogs in that regard. They are very gassy. This is why I like need scented candles and perfume. But I’d much rather have a clean-smelling but gassy dog than a low-fart dog that has that constant doggy fur stink. I just wish Jasper and Tim could’ve known each other as well as the other dogs knew Tim. I’ve never compared two pets more than I have Jasper and Plato. They seem so similar yet so different. I didn’t have that problem with Lucifer Sam and Hieronymus. Hieronymus was fawn, and Lucifer Sam is black. That seemed to be quite the dividing line between pug confusion. As soon as we brought Jasper home and played with him in our yard, I knew immediately as I watched his reaction to our neighbors that he had a completely different personality than Plato. Plato barked at our neighbors almost until the end. Jasper rarely does. He wiggles a lot and jumps up a lot, but rarely barks. We took Jasper to an indoor small dog play last Saturday, and he did not say a WORD! He was eager to get to know tiny dogs, and was very submissive with dogs his own size. Plato was always antagonistic with new dogs. Plato was an Alpha, and Jasper is a Beta, which makes a bit of a problem with Lucifer Sam, also a Beta, as they try to establish their alphaness over eachothers betaness. With Plato and Lucifer Sam, it established itself very early. Plato was in charge. Jasper is very friendly with people. His ears go back and he wants to jump up…you can see a wiggle starting throughout his body. Jasper’s tail is not waggable. It’s like a little stumpy curlique with no mobility. People often wonder if Bostons’ tails are docked. They are not. Plato had what we called a “thumb.” His tail was thumb-size and thumblike. I could wag. It also folded itself inward before he sat down on it. As he got old, the fur wore out on it where he would sit. Plato wagged his thumb around us a lot. But it took him a long time to warm up to new people. I was just noticing recently that Jasper’s ears seem much larger than Plato’s were. They seem like very big ears. Plato smiled and grinned a lot, a great big ear-to-ear grin. When Jasper opens his mouth to pant, it’s not a grinning pant, but just an open mouth. Jasper seems like such a happy, comical dog, but he doesn’t smile. Odd. Plato had what we called “a pouty little lower lip” and a noticeable underbite. Sometimes you’d see his lower teeth. Toward the end of his life, he reminded me of recent pictures of Stephen Hawking. Jasper does not have a pouty little lower lip. I’m sure he has an underbite as Bostons should, (our Cat Apollo has an underbite too! ), but it’s not noticeable. They both love/d sitting next to a furnace vent in the winter. They both love/d snuggling hard next to me in the morning as I drink coffee and check email. They both love sleeping by Stan’s feet at night as he rests on the futon. Around 2000 or 2001 When Plato was a few years old, I started a blog for him, which rubbed some people @$$#°! ?$ wrong. Today, everybody’s dog has a blog. I decided I’m going to raise Jasper as a luddite. I think he’ll be happier that way.